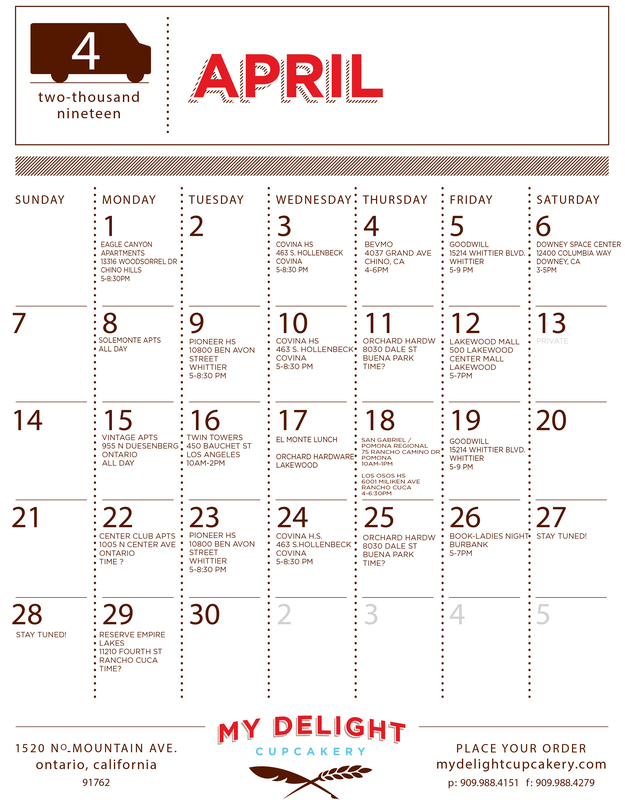 Don’t miss a single flavor, view full April Menu here. 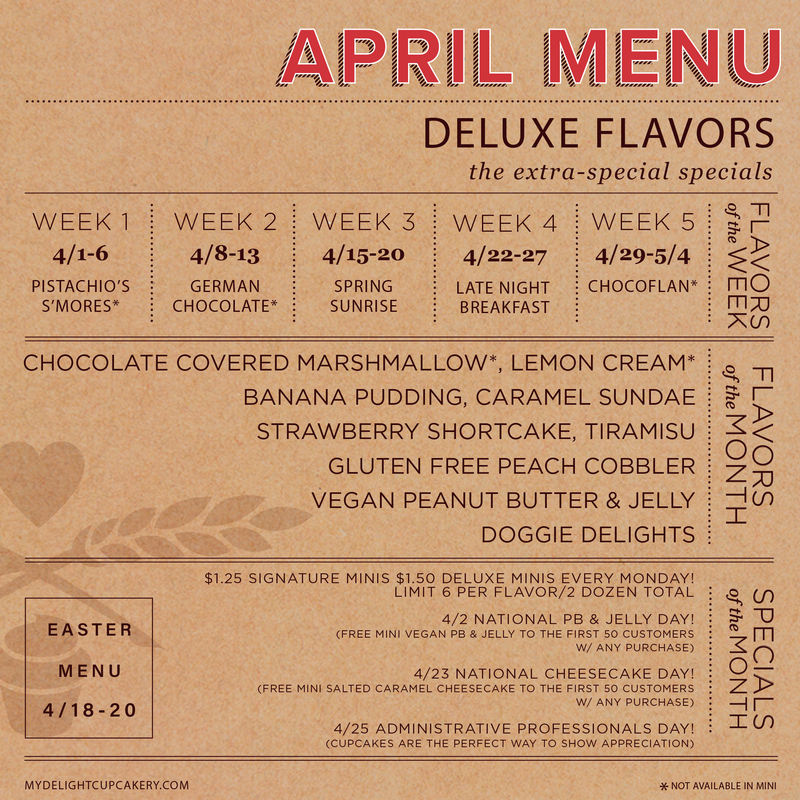 This month’s menu includes Seasonal deluxe cupcake flavors Banana Pudding, Caramel Sundae, Chocolate Covered Marshmallow*, Lemon Cream, Strawberry Shortcake, Tiramisu*, Gluten Free Peach Cobbler, Vegan Peanut Butter & Jelly plus an exclusive flavor for each week. 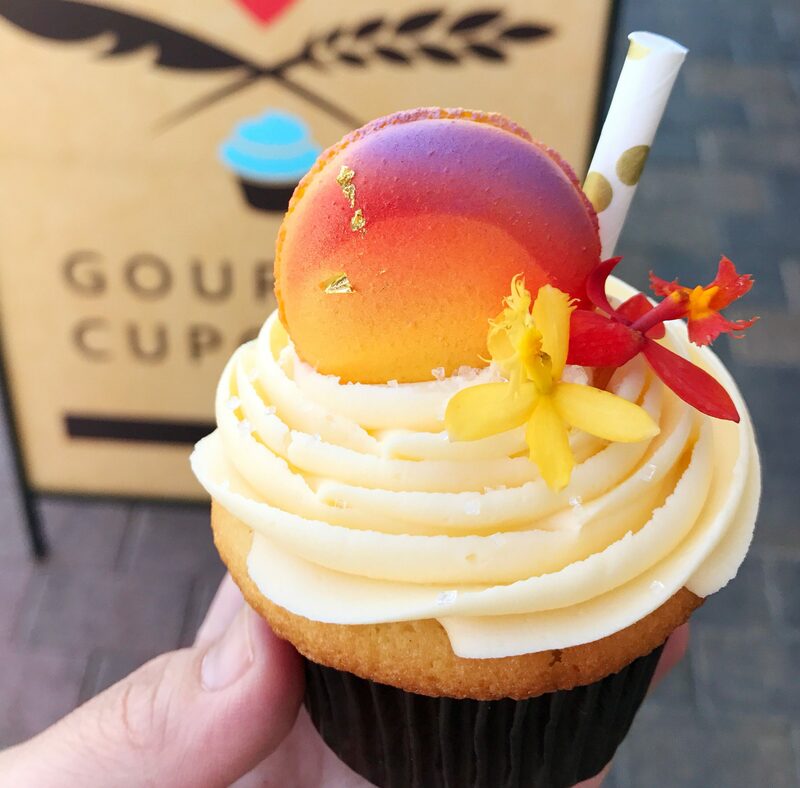 Light almond-white champagne cake, frosted with mimosa inspired buttercream with notes of sweet orange and champagne, topped with a lemon macaron and vibrant decor reminiscent of a spring sunrise. Some limits may apply to large orders. For local delivery, order online. Available daily except during holiday menus.  Sign up for delightful treats for your inbox. Don’t miss a single stop. View this month’s stops here! 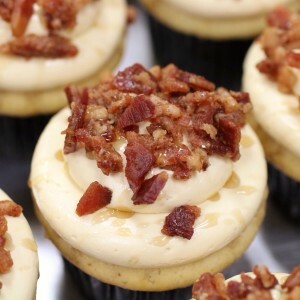 After establishing a name for themselves in their brick & mortar location in Ontario, My Delight Cupcakery launched a gourmet food truck in September of 2011. Since its debut, the truck has frequented numerous cities in the Los Angeles County, Orange County, as well as in their home-base of San Bernardino County. 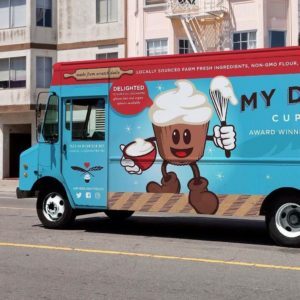 The truck has been privileged to serve patrons at well-known corporations and events like Capitol Records, Google, The Grammys, Wondercon and E3 Expo, as well as participating in countless fundraising events for schools, churches, and non-profit organizations. Inside the custom-built My Delight Truck, one will find an impressive gourmet kitchen on wheels. Stainless steel from floor to ceiling, this kitchen features the expected refrigerator, freezer, and sink, but also custom-built stainless steel racks that can securely hold thousands of cupcakes for travel. The large glass display window allows patrons to view rows of delectable treats they can choose from. My Delight is often complimented on the truck’s design and was recently dubbed “Best Looking Truck” by a popular vote organized by Fred Duran of Freddy’s Food Court. 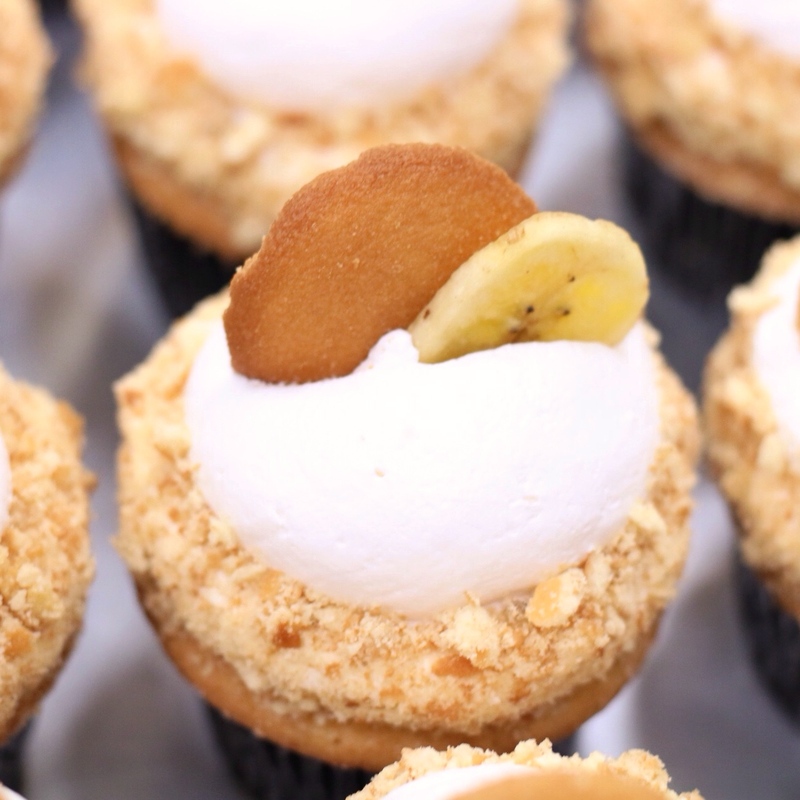 What fans love best about the truck, however, isn’t on the outside; it’s the award-winning cupcakes that keep people lining up. 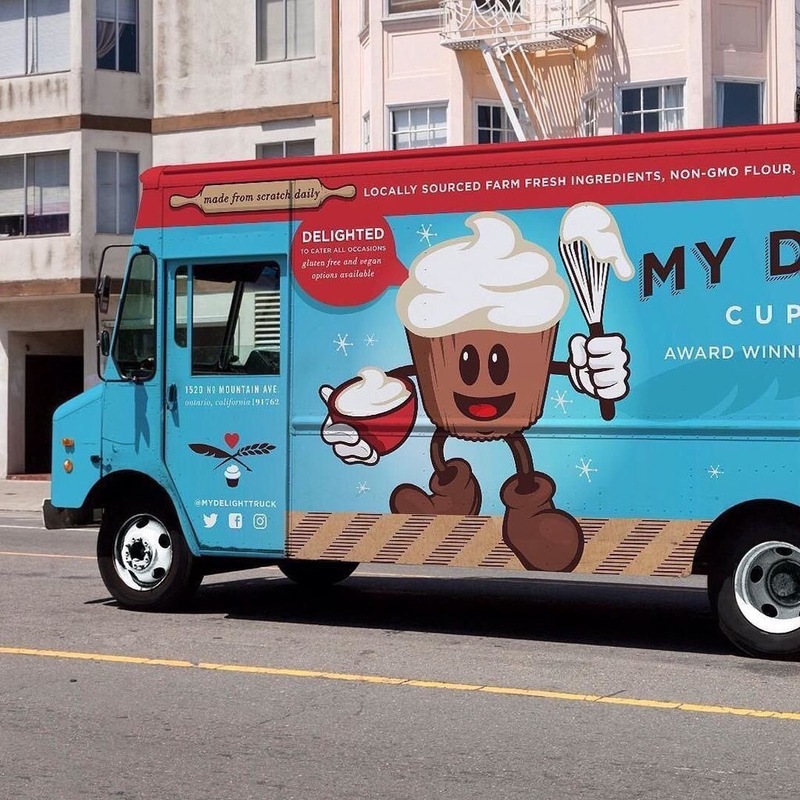 To inquire about booking the My Delight Truck to cater or vend at your next corporate, community, or school event, please email foodtruck@mydelightcupcakery.com. 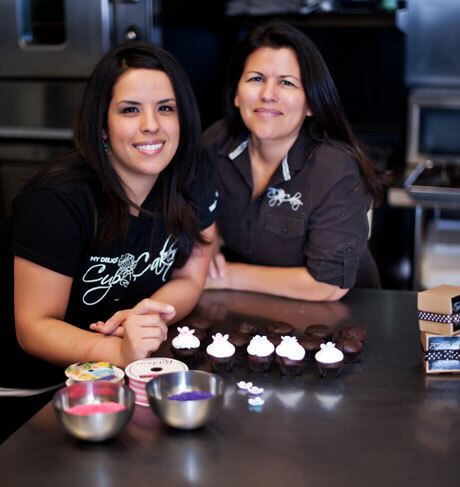 Mother-daughter team Melinda and Naomi Moreno founded My Delight Cupcakery in 2009 with aspirations to innovate the pastry world, while sharing their carefully crafted cupcakes with the world! Naomi was blessed with a talent for baking since childhood, providing cakes for friends and family since 1998. She turned her passion into a profession after graduating from Le Cordon Bleu College of Culinary Arts as a pastry chef. While busily working in several bakeries and restauraunts, her independent work from home began to boom. Gaining higher demand, she quickly outgrew her family kitchen and began to embrace the idea of owning her own bakery. It had been a lifelong dream to have her own shop. At only 26 years old, however, Naomi did not have the means to do it alone. Naomi’s mom and biggest fan, Melinda, along with the support of her family also believed in her dream, so opening shop happened organically. Having run the administration side of a church for over 20 years, Melinda knew a thing or two about managing and took on the role of co-owner. After many trials and obstacles, My Delight Cupcakery opened their doors to a long line of cupcake enthusiasts, becoming one of the Inland Empire’s first cupcake-only bakeries. My Delight Cupcakery has become one of Southern California’s prominent go-to cupcake stops, winning multiple awards for their consitency in innovation as well as mastering tradition. For catering and corporate events, email info@mydelightcupcakery.com. For truck reservations, email foodtruck@mydelightcupcakery.com. 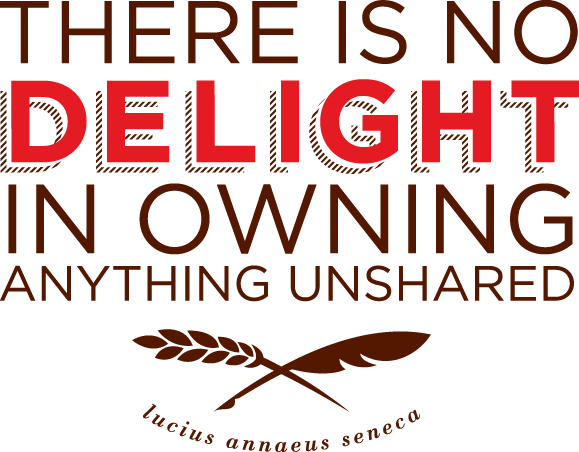 My Delight is located just south of the 10 Freeway in the Gateway at Mountain Village Shopping Center (with Toro Sushi, Wing Nuts & Starbucks) in Ontario, CA. Our door faces Wing Nuts. We love to offer special discounts and frequent giveaways! Follow us on instagram for repost monday, like us on facebook and join in on the tag a friend tuesday fun, and follow us on twitter for special deals every thursday. 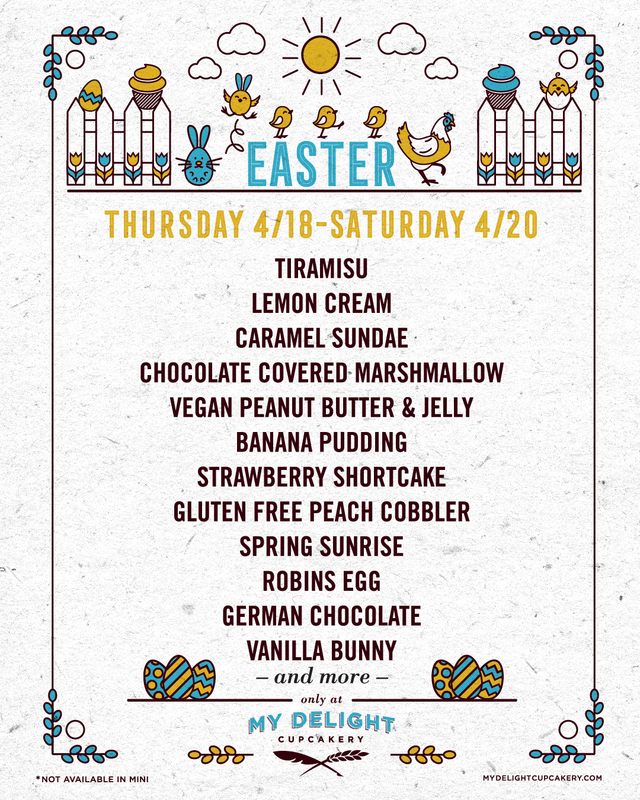 We'll also announce pop-up flavors, happy hours, and upcoming events.